Opponents of President Obama’s health care law have fought it on many fronts, ranging from multiple efforts by House Republicans to repeal or alter it to the legal challenge spearheaded by conservatives that led to today’s Supreme Court ruling on the law, which upheld a key provision. 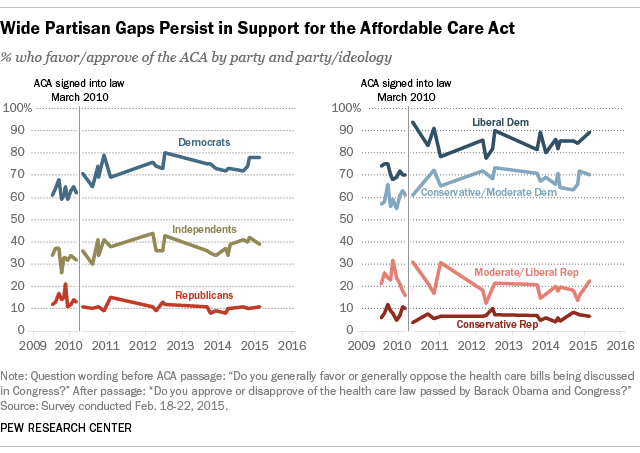 One constant in the battle over the Affordable Care Act has been the depth of the partisan divide over the legislation. The partisan divisions over this issue are long-standing and deeply entrenched. Six years ago, when the legislation was still being debated, 61% of Democrats and just 12% of Republicans favored the proposal. In the five years since the ACA became law, those differences have endured. In February, nearly nine-in-ten Republicans (87%) were opposed to the law, while just 11% approved of it, according to a Pew Research Center survey. In sharp contrast, 78% of Democrats approved of the law, including 89% of liberal Democrats, while just 19% disapproved. Independents disapproved of the law by a 58%-to-39% margin. The intensity of that divide was apparent in a survey conducted in April 2014, leading up to last year’s midterm elections. 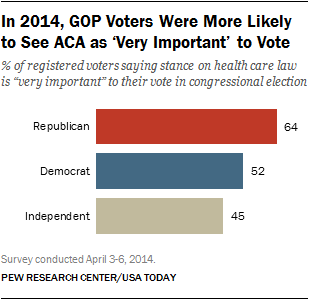 About two-thirds (64%) of Republican registered voters said a candidate’s position on the ACA was very important to their vote, compared with 52% of Democrats and 45% of independents. Aside from specific views on the ACA, Americans are also divided on the overarching issue of how far the government should go in providing health care, according to our 2014 survey on polarization in the public. Overall, about half (47%) said the government has a responsibility to make sure all Americans have health care coverage, while 50% said this is not the responsibility of the federal government. The level of ideological polarization in opinions about the government’s responsibility to provide health care was striking. Fully 89% of adults with consistently liberal views said it was the responsibility of the federal government to make sure all Americans have health care coverage. Just 2% of those with consistently conservative attitudes agreed. Looking beyond the court case, a Kaiser Family Foundation survey conducted in June found that partisans and the public at large were divided about whether the debate over the ACA should continue as the country heads into the 2016 elections. About half (49%) of the overall public said it was important to keep the debate going, while 45% said they were tired of hearing about it and wanted to move on to other issues. This divide was also reflected among Republicans, Democrats and independents.